High Speed Power Boats Rubber Ducks. V & A Waterfront, Cape Town. Group Rate/Private Charter: up to 10 persons. From the V&A Waterfront, Cape Town. Atlantic Seaboard: You will see (at high speed) the Cape Town harbour area, Robben island in the distance, great views of Table Mountain, Sea Point, Bantry Bay, Clifton, Camps Bay and the Twelve Apostles Mountain Range. 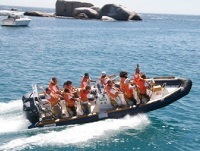 1 hour Simon's Town R700 pp. 2 hours Cape Point R995 pp. WARNING! These boats exceed 100 kph on the water.